Berwick manager Colin Cameron was naturally delighted with his side’s showing in their 4-0 home win over Clyde at Shielfield on Saturday. “We had four different goalscorers and kept a clean sheet, so it was a good all round performance,” he said. Former Motherwell youth player, Chris Ewing of the Edusport Academy. Photographed at Spartans in Edinburgh. Edusport is a football academy that brings talented French youth players to Scotland where they also gain a qualification in English. Coach Colin Cameron. “Andy Russell worked his socks off up front and got his reward with his second goal in two games, but it was also nice to see Lee Currie come back from his first half penalty miss to score early in the second half and settle us down again. 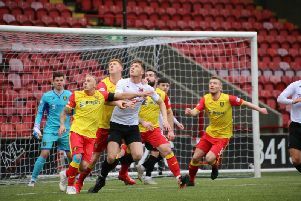 Cameron added: “We got off to a sluggish start and that was probably down to the fact we had played on Tuesday (against Montrose) and they hadn’t. It was nice to score four goals, but we keep telling the players the importance of not conceding goals, which is why it was so pleasing we kept a clean sheet. “The games are coming thick and fast at the moment, but that is what the players want and is the reason I build a squad at the start of the season. “Andy Russell is a prime example - he struggled for consistency when he first joined us and then he picked up a couple of injuries which hampered his progress. On Tuesday Rangers were due to face Albion Rovers in a Scottish Cup fourth round replay and Cameron said it was an important game for the club. On Saturday Rangers are back in action with their fifth game in 15 days when they travel to take on bottom of the table Elgin.